The Lexmark printer error lights indicate that the device is facing some technical issue. When all the lights on the printer operator panel blink at the same time, then a service error has occurred on your printer. This error refers to a printer problem. In certain cases, try to power cycle the printer and try printing. If the error persists, service the Lexmark printer. Press and release the Continue button to resume printing. Push the Continue button once to Print the menu settings page. Perform this if the printer is in a ready state. Double click the Continue button to view the secondary light sequences, perform this when the printer displays an error. Press and release the Cancel button to delete the on-going print job. Hold the Cancel button until the Lexmark printer resets. Check the toner cartridge level and replace the PC kit if required. Replace the low PC kit. Go with the light sequences to get more information about the error. Step 1: The Lexmark printer error lights indicate that there is a service error. Many light patterns are used to identify the type of error. Mostly user attendance message, paper jam errors, and service errors display a light pattern. If you double-click the Continue button on the operator panel, then a second pattern may appear with more detailed information. Step 2: In most cases, the first pattern returns, double-click the Continue button again. Check if the initial light has a secondary pattern. 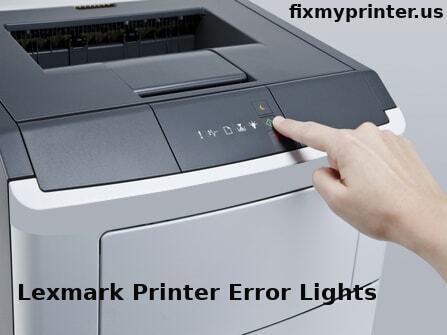 When it comes to Lexmark printers, all service errors are indicated by all the light blinking at the same time. Step 3: The secondary code indicates an area or function which has the error. If the Error and Continue lights blink at the same time, then it shows that the secondary error has occurred on your printer. To confirm the secondary error code, press the Continue button twice quickly. Step 4: A paper jam comes under the secondary error type. If the light sequence Continue, Ready, and Paper jam blinks at the same time, it denotes that the printer has a paper jam issue. Go with the instruction given below to clear the paper jam issue. Step 5: A paper jam at the input sensor indicates that an error can occur after the paper leaves the input tray, and enters the printer through the manual feeder. After resolving the paper jam on your Lexmark printer, press the Continue button to resume the print job. Step 6: The Lexmark printer’s control panel has two buttons and six Lexmark printer error lights. This indicates the status of the peripheral and the buttons used to Continue or Cancel the current print jobs. The two buttons on the operator panel are Continue and Cancel. Step 7: There are six lights used to indicate different activities that take place in the printer. The first one indicates Read or Data, second Toner Low or Replace the PC Kit, the third one denotes Load or Remove the Paper, and the last two lights are for Paper jam and Error issues. Step 8: A self-test is performed if the printer is turned on and when the peripheral is reset or printer setting changes in the menu list. Check the other operator panel functions. To resume or return to the print job, press and release the Continue button. Step 9: Get the menu settings and network setup page by pressing the Continue button once. Do this when the printer is at a ready state. If the printer displays an error message on the control panel, press the Continue button twice to view the secondary light sequence. Step 10: To cancel the on-going print job, press and release the Cancel button. Reset the printer by holding the Cancel switch until all the Lexmark printer error lights flash.